Sport plays a significant role in the culture of Port Macquarie. 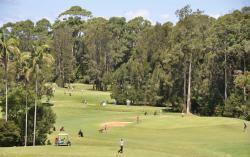 18 hole public golf course, where you play in harmony with nature. 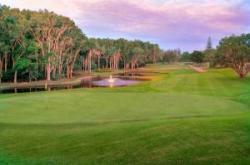 Emerald Downs Golf Course offers social play 364 days a year. An intriguing 18 hole layout. In July 1953, the Club moved to the new course but because of the necessity to maintain the old course for play, very little progress had been made on the new area. Members, however, elected to play under rugged conditions for a time in order that reasonable progress could be made. Play was first over six holes, progressing fairly quickly to eleven holes. At this point course extensions were delayed for a few years because of the need for a more suitable clubhouse. That having been achieved, the southern extension was next brought into play. Work was finally completed to a sufficient degree to bring the full 18 holes into play in April 1967, and the official opening was pronounced in February 1968, by president of the New South Wales Golf Association, Mr Les Graham.